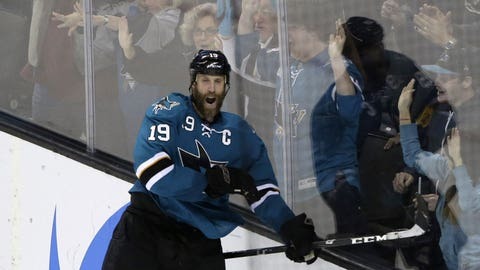 The Sharks' Joe Thornton celebrates his game-winning goal in overtime against the Wild. Joe Thornton and Patrick Marleau found the perfect way to celebrate their new contract extensions. "For me and Patty both to score, it’s a great night for us," Thornton said. "They’re our guys, and we need them when we’re down," Irwin said. "Jumbo got us to within one and Patty tied it up and obviously Jumbo won it in overtime. They’re our guys. It’s just kind of ironic what happened." "We got a point against a good team in a tough building to play," Ballard said. "For the most part we played a fairly solid game. We weren’t the best at times. But we hung in there and even after they got those two quick goals, I thought we responded pretty well. We just couldn’t find the time to get the third one tonight." "I’ve been telling Pav, `You’ve been scoring too much. Start passing the puck.’ And he finally listened," Thornton said. "I don’t too often, but Pav just made two good plays and luckily I put them in." "We lost the extra point because of the face-off circle tonight," coach Mike Yeo said. "We spent the entire night chasing and it’s inevitable that they will put you on your heels and give them some momentum. We never started with the puck. That was the big story."